The decibel (dB) is a unit used to express the energy in a sound wave. How is a Decibel Measured? The measurement of a decibel is a logarithmic scale measurement. Named in honour of Alexander Graham Bell and originally used to measure output along telegraph cables it expresses a ratio or comparison of two quantities. One decibel is one tenth of one bel and is the common reference name. Measuring to Protect our Hearing. Used for acoustic purposes or defining how loud a sound is to the human ear the dB expresses sound pressure level. 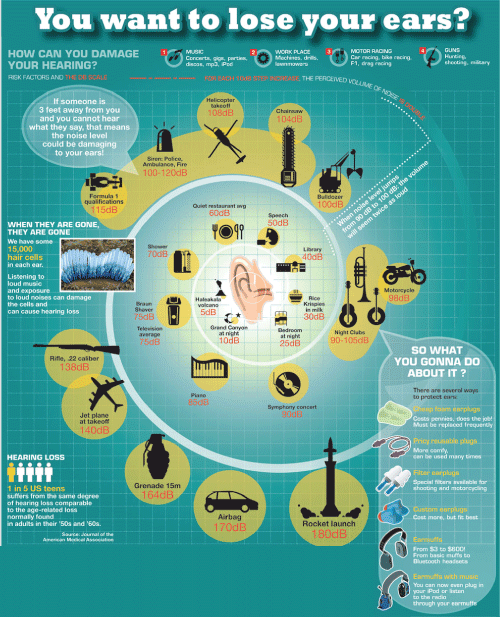 This gives us an indication of what the human ear can tolerate or how sensitive our hearing is to certain levels of noise. Knowing the levels that the human ear can tolerate and how long it will take to cause damage allows us to take preventative measure to protect our hearing. Being able to measure the dB levels of equipment, vehicles, and sound producing objects gives us an advantage to know what we need to avoid or how long we are able to tolerate certain levels of noise. Starting at the lowest level or the quietest thing that can be heard the decibel is expressed as 0 or 0dB. At levels over 85dB hearing loss or tinnitus can occur. At the pain level or very loud level the decibel is expressed as 120dB. Over 140dB can cause immediate and irreparable damage. 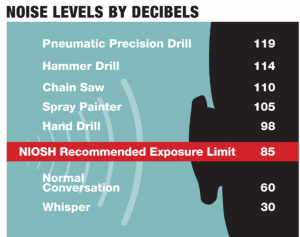 Being exposed to decibel levels below 80dB will rarely be a cause for hearing concerns. However, being exposed to higher level can definitely be concerning. The higher the level, the shorter the time exposure will be before noise induced damage will take effect. The National Institute for Occupational Safety and Health (NIOSH) suggests time frames for safety exposure.